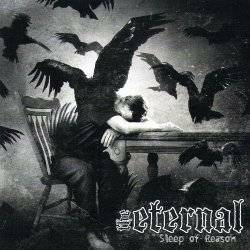 The Eternal's second album Sleep Of Reason has impressed me quite a lot. Although the five musicians are from Melbourne Australia, they sound like a European goth metal band, probably because the album was produced by the Estonian Endel Rivers (Black Majesty & Vanishing Point guitar player) and mastered by the Finnish Mika Jussila (Amorphis, Nightwish, Therion). Even if there are parallels to My Dying Bride, Anathema and Charon, The Eternal are more than just cheap clones as their mixture of doom and gothic isn't very conventional. The sound can be described as dark gothic orientated melodic doom. This sounds very bizarre, but the music itself is very complex. The songs contain much more than just a simple riff but are full of breaks. Especially the confrontation between melodic guitars and bombastic keyboards lend the songs often a dramatic touch which succeeded best on Beneath The Soil. Some songs are less experimental and could be used as single edits because of their emotive rock sound (Everlasting, A Soul Undone, A Dream's End). More doomy are the last two tracks The Dying Light and epic twelve minute closer Weight Of Empathy. The Eternal have recorded one of the best gothic doom metal albums I have ever heard. The music is so rich and varied that they certainly will find an audience. Let's hope for them that they will get the deserved recognition.